Scappoose High School received a donation of 60 scientific and graphing calculators worth nearly $7,000 from the Scappoose Parents Association on Tuesday, March 22. Candy Cole, the association's founder and vice president, said one of the association's goals is to help provide needed resources to schools throughout the district. Often, parents will ask school personnel directly for input regarding what would be most beneficial. 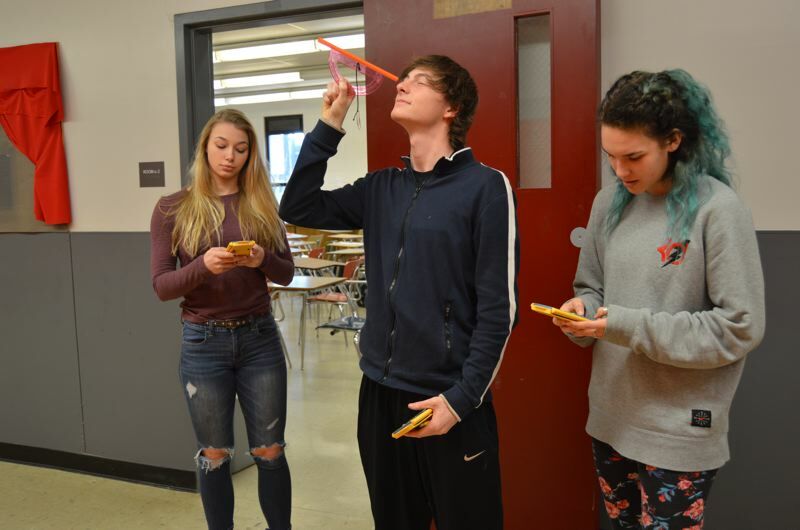 Immediately after the calculators were distributed, the students got to work using them in a math lab to calculate the height of various objects. Previously students were relying on their phones to complete the calculations. In the past, the association has helped pay for Apple iPads and laptop computers for use at the middle and high schools, as well as sets of new text books at various Scappoose elementary schools. The nonprofit association also pitched in funds to purchase a car that could be used for driver's education classes at the high school. "I really feel honored to be able to provide these things for the kids," Cole said. "The kids are our future." While Cole was overjoyed to be able to make the donation to the school, she said the association is always looking for new members to help bolster fundraising activities. Primarily, the association focuses on hosting two large-scale fundraisers each year — The Cruise-In car show and a holiday bazaar, which is sponsored by local businesses and vendors. Cole said that while a core group of board members have been organizing those events for years, the number of parents who continue to stay actively involved during the remainder of the year is dwindling. Often, parents are more active when their children are young, but fewer parents stay involved as their students reach teen years, Cole said. Tammy Belwood, an 11-year parent volunteer, however, had the opposite experience and joined the association when her daughter began high school and wanted to participate in cheerleading. From the start, Belwood wanted to work with the "Food for Funds" program, which is a volunteering opportunity with the Moda Center in Portland. Parents can work at the concession stands at the Moda Center to raise money for the Scappoose Parents Association. While the fundraising benefits the group as a whole, individuals can apply for scholarships from those funds to pay for extracurricular activities. Belwood said she was able to help send her children on trips to Washington, D.C., and Spain by working shifts at the concessions. "I think if people understood the program and how it can benefit the school district they might be more interested in it," Belwood said. Elementary schools like Grant Watts and Otto Petersen each have designated parent organizations, Belwood said. At the middle and high school level, parents and staff must rely more heavily on groups like the Scappoose Parents Association if they want to continue to stay involved in helping community schools. Cole said she hopes parents will see the benefit of volunteering with the group and what it can do for all students in the district, and get involved. The Scappoose Parents Association meets on the second Wednesday of the month, at 6:30 p.m. at the Scappoose Public Library, 52469 SE 2nd St. More info can also be found online at www.scappooseparents.org.